"Clearly and closely analyzes the actions and motivations of one of the segregationist South's most formidable institutions. Based on archival source materials, this is an original and important addition to our expanding knowledge of the mechanics of southern resistance to desegregation and the development of modern conservatism." --George Lewis, University of Leicester In 1956, state Senator Charley Johns was appointed the chairman of the newly formed Florida Legislative Investigation Committee, now remembered as the Johns Committee. This group was charged with the task of unearthing communist tendencies, homosexual persuasions, and anything they saw as subversive behavior in academic institutions throughout Florida. With the cooperation of law enforcement, the committee interrogated and spied on countless individuals, including civil rights activists, college students, public school teachers, and university faculty and administrators. Today, the actions of the Johns Committee are easily dismissed as homophobic and bigoted. 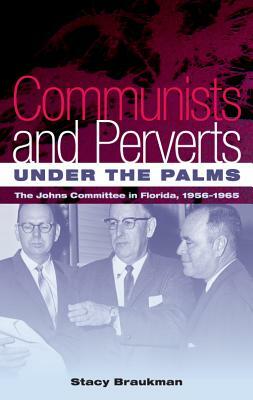 Communists and Perverts under the Palms reveals how the creation of the committee was a logical and unsurprising result of historic societal anxieties about race, sexuality, obscenity, and liberalism. Stacy Braukman illustrates how the responses to those societal anxieties, particularly the Johns Committee, laid the foundation for the resurgence of conservatism in the 1960s. Braukman is considered and nuanced in her stance, refusing a blanket condemnation of the extremism of a committee whose influence, even decades after its dissolution, continues to be felt in the culture wars of today. Stacy Braukman is an independent scholar and coauthor of Gay and Lesbian Atlanta.